As you can see here Miriam is now starting to enjoy the world of solid food. I can report, that just like her big sister she LOVES food! Having not been on solid foods very long most foods are a new experience. 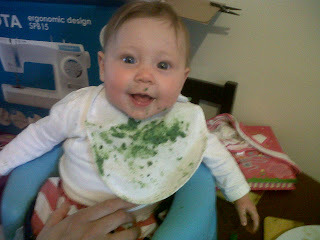 I thought you might like to see what she looked like after her first experience of spinach, she had it tonight with fish and mashed potato. Many of you will know that we (and I in particular) have been travelling quite a bit of late. My first trek was in late March, to the EMO2013 conference. (Yes, it's really called that) No papers to present at this one, just a glorious bit of networking and learning about what other people are getting up to. In case you're wondering, EMO is Evolutionary Multi-criterion Optimisation, which is using genetic algorithms to find the trade-off between conflicting goals; a prime example being what I've been up to at Loughborough, finding the trade-offs between cheap, comfortable and energy efficient buildings. The conference was held at the University of Sheffield, a couple of miles from the city centre, so we had to get a bus there at 7:30 each morning, and returned late at night after the sessions were all done. This is really the ceiling! An improvement on polystyrene tiles anyway. On our walk around the house, we were presented with this lovely table setting. Super! The one sad part of it all is that it's getting harder to leave all the girls behind. Naomi was very sad that I was gone, and most happy to see me when I returned. As an aside, in an exciting move, Naomi's getting good at doing puzzles! My next trip was to a wintry Stirling. More on what that was all about later, but for now, here's a shot of the view from the Computing department windows there. Yes, that's the Wallace Monument. A car with Peppa Pig in it. Does life get any better?